Remembering the Great War 1914 - 1918 through rarely seen prints, drawings and watercolours from the Ashmolean Museum’s Print Room collection. As we approach the centenary of the end of the First World War this exhibition showcases a range of rarely seen prints, drawings and watercolours from the Ashmolean Museum’s Print Room collection. 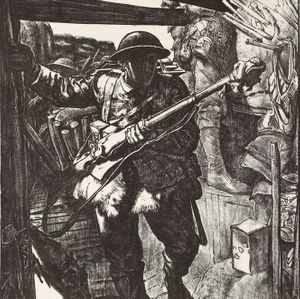 Dramatic depictions of action on the front line contrasted with scenes of life on the home front reveal the effects of the First World War on soldiers and civilians alike, as seen through the eyes of contemporary artists. 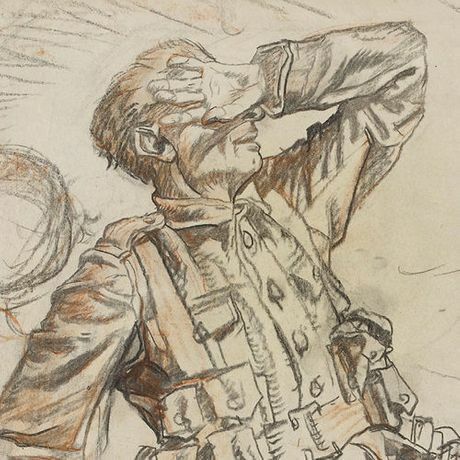 The wide-ranging selection includes work by eight official British War Artists, such as Augustus John, Frank Brangwynn, Eric Kennington and Christopher Nevinson. The exhibition shows how they and others responded with astonishing creativity to the horrors of the Great War. Exhibition Organised by the Ashmolean Museum, University of Oxford. Please note, the museum is closed on Sundays.